I remember when I turned 14. It was July before my freshman year, and I had one thing on my mind: high school. And they weren’t happy thoughts. Terror might be an appropriate word to describe most of my emotions. My public school housed more than 1200 students, and I was convinced I would get lost, be made fun of and probably fail out of high school all in the first day. None of these fears was grounded in reality, of course. But there’s something that happens in a teenager’s mind between learning a fact and processing it as reality. That fact travels through that teen’s hopes and fears filters, coming out the other side embedded as truth, however fictitious that may be. All this to say that I don’t remember enjoying my 14th birthday. In fact, I don’t remember it at all. I just know that summer was one of fear. So I was happy to see my 14 year old embracing her second year of teenagehood with the optimism and joy this birthday deserves. She had a few (very talkative) friends over for the night, and we celebrated with the dinner of her choice and Duck and Bunny cupcakes I fetched on the way back from my cousins’ weekend in Rhode Island. And with flavors such as Hot Chocolate, Dark Chocolate Salted Caramel and Banana Nutella, it was agony choosing which one to devour. That was Birthday Eve. 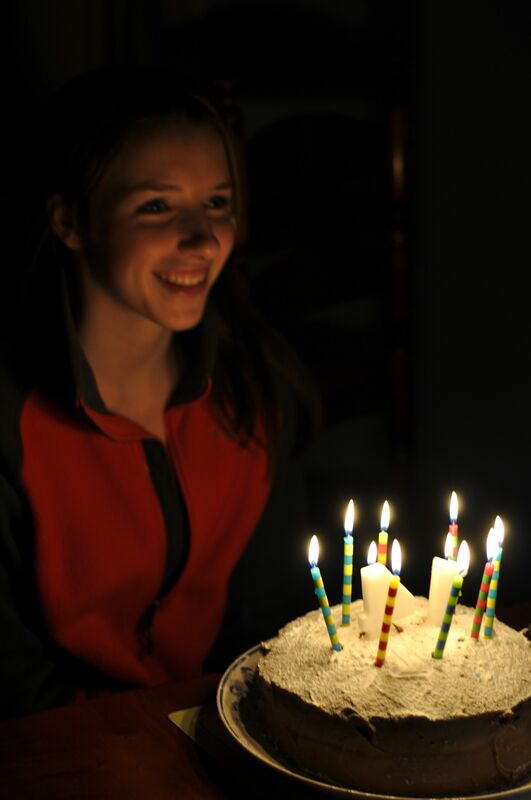 The actual birthday was celebrated with a day off of school (MLK, Jr. holiday), the cousins coming up for a visit and a homemade dinner, which of course featured her favorite cake, banana with caramel frosting. The incredibly moist cake with the penuche-like frosting disappeared too quickly to snap a photo, but at least I got the candle shot. Getting back to the dinner, I pulled out an incredible recipe from Barefoot Contessa, perfect for a chilly January night: Chicken Stew with Biscuits. That’s code for chicken pot pie without the crust. 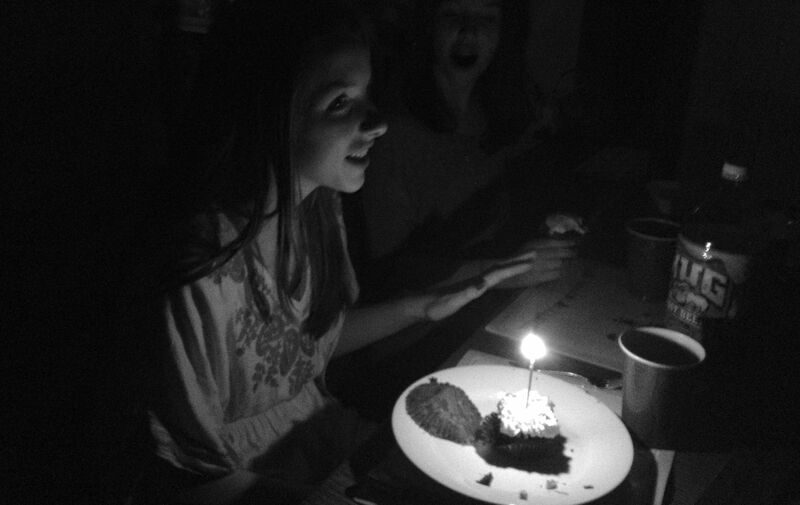 The night was filled with savory smells, bubbling laughter and warm hugs, just how a fourteenth birthday should feel. And it was that much sweeter watching my little lady soak it all in with her glowing smile, not a care in the world. 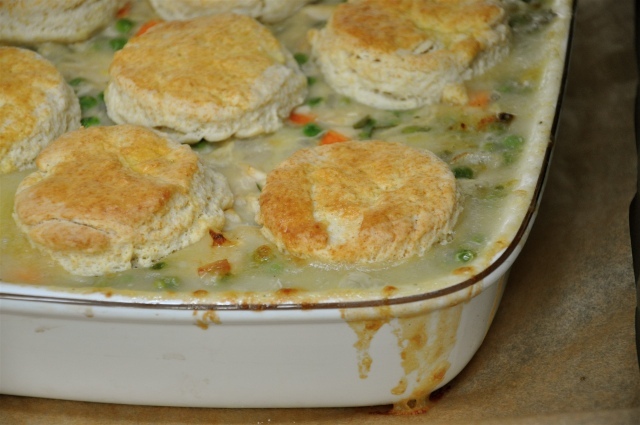 Chicken stew with biscuits? Yum….this looks so good. I love using biscuits and croissants to come up with fun recipes. Beautiful post. She looks so beautiful and grown up — sniff, sniff.